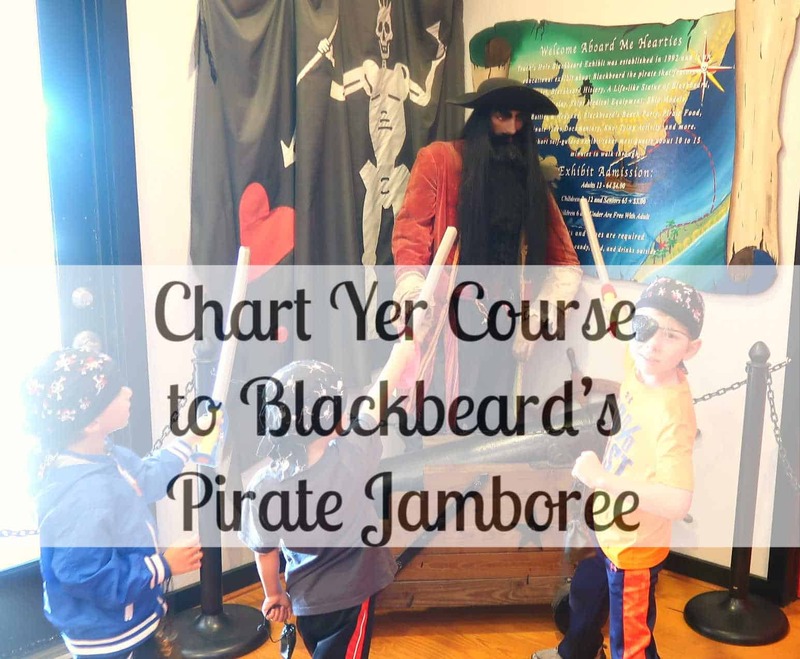 Chart Yer Course to Blackbeard’s Pirate Jamboree! 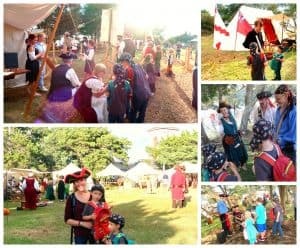 Last year, as I traveled to the East Coast I stumbled upon the most amazing festival, event, a pirate jamboree on an island only accessible by a boat or small plane off the coast of America: Blackbeard’s Pirate Jamboree on Ocracoke Island. Blackbeard was an infamous and eccentric pirate of the early 1700s who met his doom at Ocracoke Island. This post contains some affiliate links. 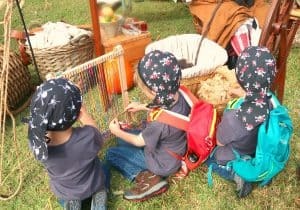 For four days, my boys and I were dressed as pirates and took part in a living history event. Shiver me timbers! 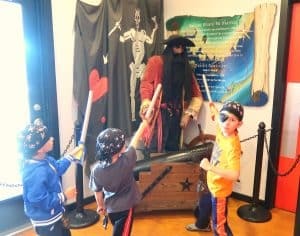 I’ve never had so much swashbuckling fun with my boys! This year, October 25-28, 2018, will be the 300th-anniversary celebration for Blackbeard’s Pirate Jamboree on Ocracoke Island. 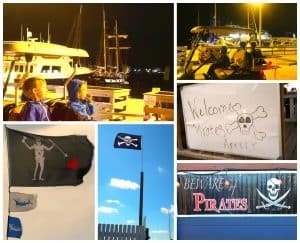 The Island really transformed into a pirate jamboree, beginning with ships coming to port in the Silver Lake harbor that were sporting the Jolly Roger (pirate flag featuring skull and crossbones) and some were authentic looking pirate ships. Pirate ship coming to port and Jolly Roger flags/signs going up everywhere. The Pirates are coming!!! We also saw The Meka II, The Ada Mae, The Ranger, and a Coast Guard Cutter ship. A historically accurate pirate encampment was set up close to the harbor. In the encampment, people could walk through and experience what coastal life was really like during the 1700’s. 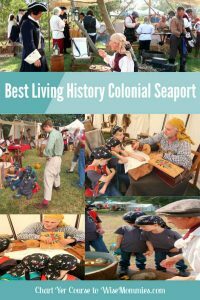 There were living history exhibits, tavern games, and pirate skits. Next to the encampment was a marketplace of seafaring crafts and wares. 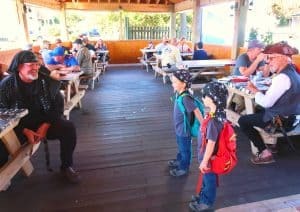 In the pirate encampment, my boys got to watch the TSC Pirates battle with real cutlasses and sabers in both pirate and Royal Navy styles. 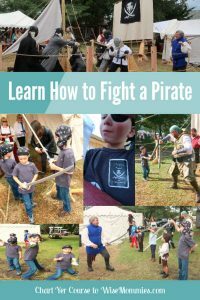 Children were given introductory lessons on how to fight with a cutlass. Following the introductory lesson, for those brave enough to continue, they got to bout against one of the pirates. The reenactment of the infamous last battle of Blackbeard. A fierce ship-to-ship battle with cannons roaring recreating that fateful day of Blackbeard’s defeat. 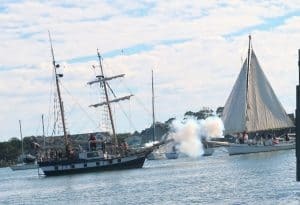 Around the Silver Lake and NPS Docks, for about an hour, we watched the reenactment of the infamous last battle between Blackbeard and Lt. Robert Maynard of the British Royal Navy. This was a fierce ship-to-ship battle with cannons roaring recreating that fateful day of Blackbeard’s defeat. We also watched an interactive game show which was hosted by historian/author Kevin Duffus, “Will the Real Blackbeard Please Stand Up?” My boys really got into the guessing game, answering the questions and trying to guess which Blackbeard was the real one per their acquired knowledge from the Blackbeard Exhibit (exhibit info below). The Motley Tones performed music all around town! 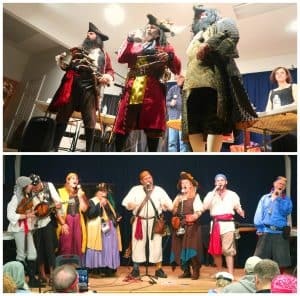 In addition to the game: The Motley Tones performed rollicking good music and fun at the pirate events and the pirate encampment. They were entertaining, hilarious, and truly rollicking good music and mayhem. 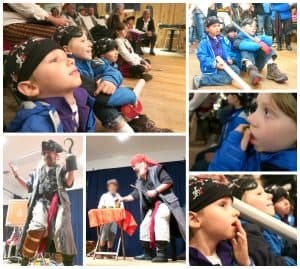 Nearly everyone from young to old and even pets were dressed as pirates and became real-life acting pirates. People were using pirate slang and singing rowdy songs. Sometimes other pirates would stop my boys, holding up their own cutlass or sword, and demand booty. “Aaarrgghh lads gv mae ye booty aarrgghh else ye lads be shark bait.” My boys would usually challenge by holding up their own cutlass and letting them know that hadn’t any booty but were up for a good sword pirate fight while unleashing their own Aaaarrrrgggghhhhhs. Since we hadn’t planned on becoming pirates, we didn’t have anything pirate with us. We headed to Teach’s Hole which is a pirate specialty shop on the Island. Here we found the coolest pirate head wraps, cutlasses, pirate books, hats, and more. Once we were dressed in “proper” pirate attire, we went through the Blackbeard exhibit which is inside Teach’s Hole. To learn more about Blackbeard, his ship, other famous pirates, pirate flags or weapons, go to their website Teach’s Hole. Better yet, go to them on Ocracoke Island!! It’s a very small museum and only took us under 20 minutes to walk through the exhibit. My boys were very interested in the facts and figures. They wanted me to read all the information that went with all the artwork and artifacts, so it probably took us a little longer than most to go through the museum. 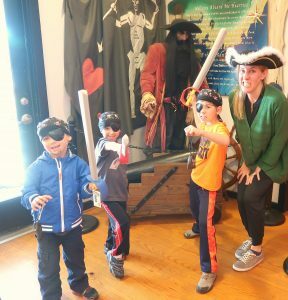 This museum was the perfect introduction into the life of Blackbeard, broader insight into the life of a pirate at that time and facts about other famous pirates. There is also a hands-on knot typing activity, a short documentary about Blackbeard’s life and death and a scale model showing Blackbeard’s ships, speaking of which, the Queen Anne’s Revenge, his flagship has been discovered off the coast of North Carolina. Walking around with my boys! Blackbeard’s Pirate Jamboree. Blackbeard’s Pirate Jamboree takes place on Ocracoke. This island can only be accessed by a passenger/car ferry, private boat or small airplane. There is no bridge to Ocracoke. Once on the island, we got around either by foot or golf cart rental. 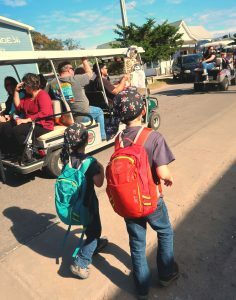 Once we were on the island, we got around either by foot, golf cart rental, or the bicycles and scooters which I had in the car. Ocracoke Village has a speed limit of 20 mph making it even more family friendly for getting around. Shark bait = What you are after you walk the plank. Cutlass = A curved sword, that is thick, heavy and shorter than most other swords with a single sharp edge. A blade for pirates! Finishing up our Pirate Jamboree Experience:. 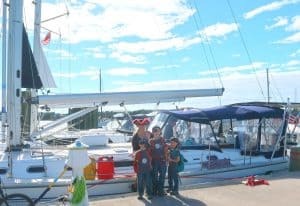 If you haven’t been, add it to the family bucket list, and chart yer course to Blackbeard’s Pirate Jamboree on Ocracoke for one of the Annual Blackbeard’s Pirate Jamboree events. We had the WHOLE beach to ourselves 2x nights!! 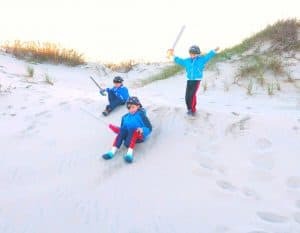 My boys loved playing pirates around the sand dunes. Have you been to Ocracoke or a Pirate Jamboree? What’s one of your favorite destinations discovered while traveling? 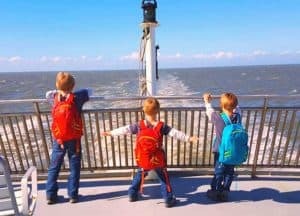 Another Road Trip Break Idea and Roadside Attraction in the USA that we discovered: On the way to NC, we spent some time at this Lost Sea and loved it!